Every time I look in the mirror I receive a jolt. Who is this woman staring at me through eyes marked by a spray of smile lines, with hair the colour of antiqued pewter? It’s not the signs of age that shock me—it’s the overall effect. The woman in the mirror looks mature in all senses of the word. She certainly doesn’t match the image I have carried of myself through most of my life—the image of someone young, a child even. Someone who giggles and speaks in a sing-song voice. Someone gentle and mistake-prone and completely lacking in authority and wisdom. But the grey hair and smile lines have started to dupe the outside world. Apparently, they think I have something to say, as evidenced by the number of invitations I am starting to receive to share “my wisdom” at conferences and gatherings. Case in point: I was invited to speak at a conference on the other side of the continent by a prominent and well respected writer and thinker. He had invited other prominent writers and thinkers. And, he had invited me. I was so honoured and thrilled to meet him, I forgot to be incredulous. Then I checked the bio pages on the other speakers’ websites. All were men. All had PhDs. All had published numerous books. One man’s accomplishment list, detailing awards, honorary degrees, and published papers, was so long I had to click the downward scroll tab for at least 10 seconds. I ordered a few of my fellow speakers’ books so as to be in the know. The first one arrived a week later—hardback, Oxford University press, and with such heft it could easily double as a lethal weapon. And so, naturally, I felt like an impostor. Like a little girl who had dusted talcum powder in her hair, put on her mother’s business suit, and snuck into an erudite adult world to which she didn’t belong. I whined about this to my husband who related my feelings of insecurity to a mutual friend—a woman who happens to hold a PhD and has taught classes in women’s studies. Hearing this helped. It helped a lot, actually. I suddenly felt part of a sisterhood of women coming out of the shadows, taking their place in the world of ideas and innovations and activism. So I went to the conference. All by myself, way across the continent, to take my place in this circle of clever men. And I made mistakes, even childish mistakes. The first night I was speaking in a graduate level writing class and launched into a story about one of my heroes, Maya Angelou. As an aside I said, “I think she lived in this part of the world.” To which all the students in the whole class exclaimed, nearly in unison, “Here! She taught here. At this university!” Oh, right. How could I have not know this!? The second mistake occurred after our conference presentations, when all four speakers and our moderator gathered on stage to informally riff off each others’ talks. A lanky and uber successful African American young man, who I very much expect to become President of the United States one day, asked about the political influence of the organization I was representing. The truthful answer: virtually none. But “none” isn’t a very powerful, nor inspiring word so I bluffed, then floundered, then totally lost my train of thought—completely. Total blank. On stage. In front of everyone. And then, I laughed at myself on stage, in front of everyone. I admitted that I was just BS’ing and that our work wasn’t the least bit political—this wasn’t our calling. Neither was it my calling in that moment or throughout the conference to put on an aura of authority. I realized this most poignantly from my fellow speakers. The author of the scholarly tome spoke in gentle tones and created a relationally spacious community out of our little group through his thoughtful questions and active listening. The guy with the accomplishment list as long as my leg laughed and joked in the most delightfully self-deprecating way that it was no surprise to learn later that his His Franciscan pseudonym is Brother Coyote (aka, the trickster). 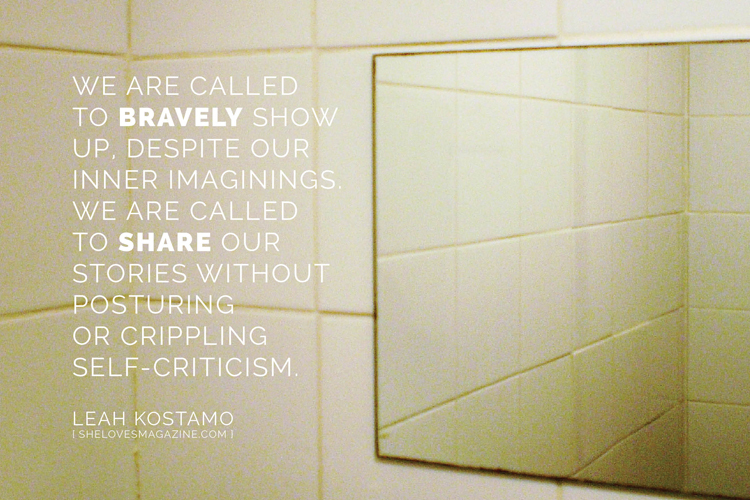 We are called to share our stories without posturing or crippling self criticism. I think the quality both these men embodied is humility. It seems that this is a virtue that stands in radical contrast to insecurity. By their invitation and example I realized we all—women and men alike—are called to the same thing: humble strength. We are called to bravely show up, despite our inner imaginings. We are called to share our stories without posturing or crippling self-criticism. We are called to cast out wisdom, gained by experience and evidenced by grey hair and wrinkles, like seeds that they might flower in the world. Leah Kostamo is the author of Planted: a Story of Creation, Calling and Community, a book Eugene H. Peterson called “remarkable” and Margaret Atwood called “clear-sighted and humorous.” She likes to read (and write) wise and winsome stories that inspire people to be the change they want to see in the world. She can be found online leahkostamo.com and @leahkostamo. She ministers with the Christian conservation organization, A Rocha. Planted: A Story of Creation, Calling, and Community.